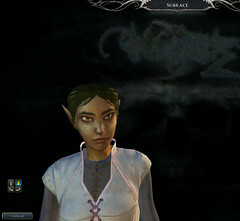 Neverwinter Nights 2 is a 3D role-playing game set in the Forgotten Realms. The fantasy game art for creatures closely, if not exactly, matches the Dungeons & Dragons 3rd Edition roleplaying game and some of it was probably simply imported from the previous game, Neverwinter Nights game. 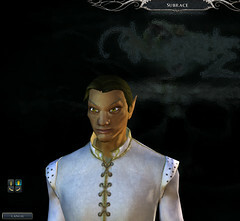 This page of fantasy game art from the Neverwinter Nights 2 computer roleplaying game has general information on the wood elf playable race. Wood Elves are reclusive and solitary although not as withdrawn from society as the nearly feral wild elves, so it is rare, but not unheard of, to see wood elves venture from their homes in the High Forest. Wood elves are uncommonly strong for elves, but also smaller and less intuitive than most elves. Also called copper elves, they have coppery skin tinged with green, and brown, green, or hazel eyes. Their hair is usually brown or black, with blond and coppery-red occasionally found.